Due to certain key components becoming unavailable with no advance notice, the Halimeter®is being re-designed. We regret this situation, but are able to offer the Halimeter® Blu as an alternative. Rest assured that the Halimeter® Blu will offer the same accurate and reliable performance for breath testing. We will keep you updated as to our progress on the new Halimeter®. Research has indicated that hydrogen sulfide, methyl mercaptan, other thiols, and dimethyl sulfide, collectively referred to as volatile sulfur compounds (VSC), are the principal malodorants in chronic halitosis. These compounds are generated by anaerobic bacteria, located principally on the back of the tongue. The American Dental Association confirms that millions of people suffer from this condition in the United States alone. While many people are heavy users of over-the-counter mouthwashes, capsules, and mints, unless they are specially formulated to treat this affliction, they are of almost no long-term value. Download our latest Halimeter® brochure in PDF format (134 KB). Based on sensor technology proven in industrial applications for more than 40 years. Click here for the United States Food and Drug Administration (FDA) status of the Halimeter®. 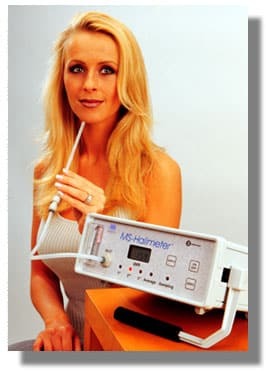 Many practitioners find it quite beneficial to use the Halimeter® in conjunction with a recording device. One popular option is a strip chart recorder (penwriter), also offered by Interscan. In this way, a record called a HALIGRAM® may be obtained, which is important for comparison and patient file purposes. The Halimeter® is intended to be utilized as part of a total program, encompassing a thorough history and physical examination of the patient. Our Experts’ Forum features many useful articles on diagnosis and treatment modalities, including excellent clinical charts. The emotional involvement of many patients with chronic halitosis, as well as the possibility that underlying conditions may be present, require that the practitioner follow a well-established diagnosis/treatment protocol. The Halimeter® has found its greatest acceptance as a result of the recognition that chronic halitosis is nearly always a dental problem. Complementing this is the availability of special formulation mouthwashes and tongue cleaners which remove the VSC’s and may also kill the offending bacteria. In just a few short years the Halimeter® has become the premier instrument for chronic halitosis research, diagnosis, and therapy. Used by over 3,000 dentists in private practice and academia, the Halimeter® offers greatly enhanced patient outcomes, as well as profitable opportunities, in the treatment of oral malodor. 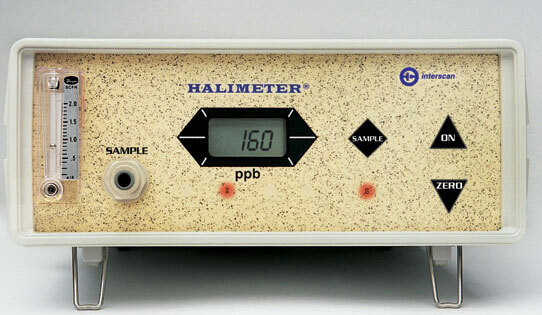 Please note that the Halimeter® model pictured above, with the special handle, is NOT standard, but is only offered in certain markets outside of North America. Please consult the factory for further details.